We cover a lot of music styles here at Bullet Music, but the Jon Stickley Trio is one of the more interesting acts I've gotten to cover. A truly progressive bluegrass band, their sound is much groovier and heavier than I expected, and while their music feels experimental and wild at times, they play together with such tight energy and cohesion that it's hard to know what is rehearsed and what is free-form. I sat down with Jon Stickley himself over cocktails at Leon's Full Service in Decatur to talk about where that sound comes from and how they have carved out a niche for themselves in the wide world of music. 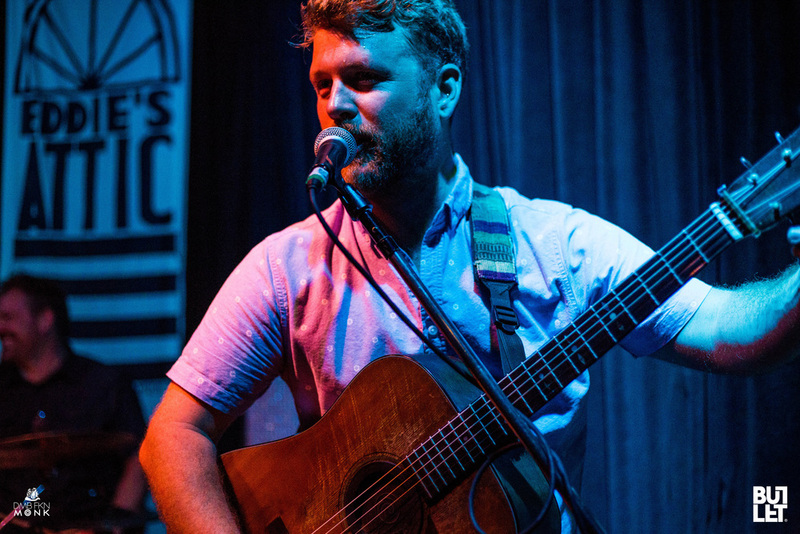 The Jon Stickley Trio has been the current lineup for the past three years. You personally write out a lot of the music, at least in demo form, and then the band comes together. Explain the process around that. The format we’ve settled into is that I’ll come up with a simple demo of a song idea. Basically two parts, a bridge, and one last part. I make a simple demo, send it to them, have them listen to it, and we get together and we work up the most basic version possible of the song. And then we just start playing it at shows. That’s when the ideas really come that are spontaneous. You’re accessing your unconscious because you’re in the moment and you come up with the coolest stuff. No, but we do some of the things that jam bands do and we have some of the elements. We wouldn’t like to be called a jam band, but we would love to play jam band festivals, and we do love playing jam band festivals. Sometimes we jam out a little more in those settings, and we do have an element of improvisation. We’re somewhere between jazz and jam. Not too heavy, but we like to rock on the groove. If a lot of your songwriting process is improvisational, how do you decide which version of a song gets recorded for the album? That’s part of the writing process and the road testing that we do. We make a lot of adjustments within the first few months of playing a song. We start with a basic version, tweak it and tweak it, and finally it gets to a set version that we play in a similar way every night. We leave space for improvisation, with some songs more than others. Then, when we go to hit the studio, we re-examine things song by song. Some songs we just record the first take, but others that are more technical, we don’t hesitate to produce those songs and layer things. The band plays a lot of different small venues and also festivals. Do you have a preference for either environment? One of my favorite things about the band is that we can tailor our sets to a lot of different types of crowds. We play everything from house concerts, listening rooms, straight-up bars, venues, and festivals of many different types. Some of the festivals we play are traditional bluegrass, and we’ll be the one different band. Sometimes we’re the most acoustic band at somewhere like Hulaween. We enjoy playing for the different crowds because you get to put on a different show. Sometimes we’ll play a dance set, but sometimes if it’s a listening audience, we’ll play our more technical stuff. It’s a lot of fun because it keeps it fresh for us. For young people these days who want to share or perform music, DJing is often a much easier and more attractive way to get started. Do you think that young people have a diminished appreciation for live music or the skill of playing musical instruments? Or, conversely, do you think it helps bands like you continue to stand out? I’m a personal fan of a lot of electronic music. I think any way that people are experiencing music and getting excited is good. And often that musical experience goes with a chemical experience, which I think is cool because they’re doing that instead of watching TV. It’s so tied to music and it works in big crowds. You get a festival EDM kid who one day hears Jon Stickley Trio and we’re playing a dance beat. I think there’s a lot of crossover. Do you have a favorite chemical to recommend as a pairing with the Jon Stickley Trio? Yeah, I think we probably go well with a lot of different things. We have played to some pretty tripped-out audiences. I’m very conscious of the general vibe, so playing for people under the influence is one of my favorite things to do. I’ve been there, and I’ve known what I wanted to experience. Certain things are bad, and certain things are good. It’s not that hard to figure out, so leading people along an experience is pretty fun. And I take it very seriously. I’m not going to do anything to harsh anyone’s vibe. We’re only here to spread good energy. A crowd is your dance partner, they’re almost your instrument. Some reviews of you, and some descriptions I’ve read mention your hip-hop influence, but I haven’t heard it myself in your music. Can you explain what you mean by that? We don’t do songs that sounds like hip-hop, but it’s more that Lyndsay (violin) and I come out of a bluegrass background, which is very on top of the beat and very straight. It’s up-tight and we ride the front. Patrick’s (drums) inclination as a hip-hop backbeat drummer is that he has a pocket groove which lays back on the back side. We’ve really met in the middle. We’re trying to blend as many styles that we like in the best way possible. Some things work better than others. I know the band is entirely instrumental now. Do you have plans to work with any vocalists in the future? We’ve had some guest vocalists like Stephanie Morgan who wrote lyrics to one of our songs and performed it with us. One of the coolest things we’ve done is collaborate with bass players. They will sometimes sit in with us at festivals, upright and electric. Lyndsay and I both have bass pedals on our instruments, so we can get lower, but it’s cool having a bass player sit in with us. We do want to collaborate, but the one hesitation I have is that I want to be very careful with what we add in because I don’t want it to be missed when it goes away. For the near future, we’re just going to pump the trio as much as we can because building a band and a sound and a brand requires all your energy. Do you have any upcoming projects that we should keep an eye out for? We’re going to do a new album in December, which is not named yet. We have an EP called Triangular coming out some time in the Fall. That will be available as a pre-order as part of a Kickstarter to create the next full-length. We plan to get to a lot more festivals and hopefully inspire a lot more people to do hybrid music of their own. A few hours after our conversation, I returned to enjoy their live performance. Sadly, the venue was only about one third full, but that didn't deflate the energy of the performance one bit. Their heavy riffs and wild rocky mountain tumbling tunes kept us all bobbing and dancing all night. I had a very enjoyable evening, and at the end of the night, all I could see were smiles on the faces of the clapping audience members around me. If you get a chance to see the Jon Stickley Trio at an upcoming festival or nearby venue, I strongly suggest that you check them out. Sam is a correspondent for Bullet Music, but has a strong background in the software industry as a product engineer. He is a lover of all music, but can most often be found covering the electronic scene in Atlanta.